The Mahatma Gandhi Mission (MGM) New Bombay Hospital Vashi is one of the most advanced multi-specialty tertiary care centres in the heart of Navi Mumbai in India. Since 1993, the hospital has experienced rapid growth to become a key player in the healthcare sector of this up-and –coming satellite city. In line with the principles and ideals of the Mahatma Gandhi Mission, MGM seeks to create affordable, sustainable and quality healthcare for the community. As such, Our Motto is "We Hold the Dignity of Patients to be Paramount." Well-equipped, computerized NABL Accredited Pathology Laboratory. International standard 36- bed Critical care and 12-bed Neonatal Intensive Care Units. State –of-the-art Operation Theatres and world – class Dialysis and kidney Transplant The hospital's sophisticated Accident & Emergency is equipped with 10 beds - fortified with most advanced life-saving facilities such as cardiac, trauma, and minor operation theatres within the department to manage all major life saving procedures. MGM Hospital New Bombay Is 176 Bed Hospital, One of the most advanced multi-specialty tertiary care centres in the heart of Navi Mumbai in India. Since 1993, the hospital has experienced rapid growth to become a key player in the healthcare sector of this up-and –coming satellite city. MGM Hospital Have state of the art ambulance services. 24/7 quick service. With being navi Mumbais 1st 3 Tesla MRI machine we provide the best class of technology available. Very experienced team of doctors and nurses. With Mahatma Gandhi Mission Foundation. 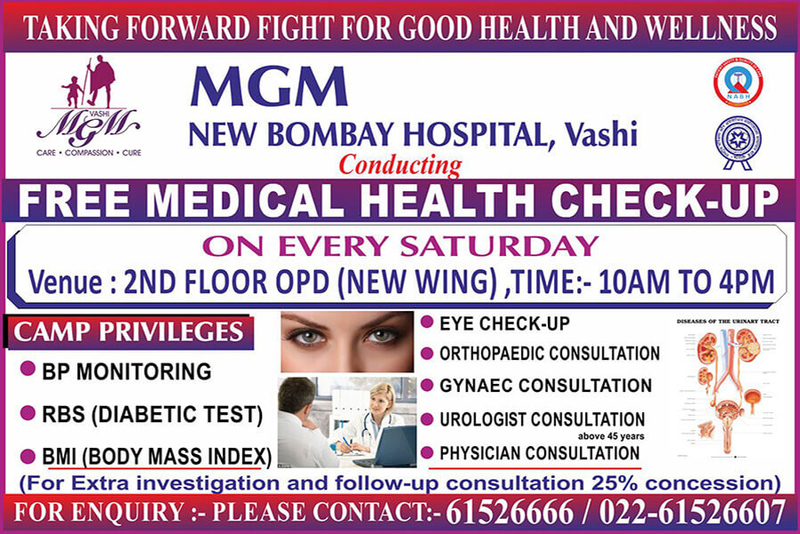 MGM Hospital along with its university as well as chains of Hospital all over Maharashtra we Give out free Medical checkups and free Healtcare services for the needy one.